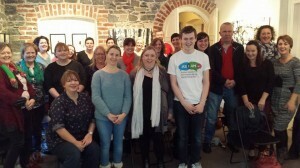 AsIAm.ie recently launched its first programme, which see trained volunteers visit Secondary Schools across the country. The aim of the workshop is to create understanding and awareness of the condition among Second Level Students, in order to benefit students with Autism and also those with the condition in the wider community and of course society as a whole (which can only win by being more inclusive of people with Autism). We aim to bring the programme to 100 schools in 2015 and to develop and increase the capacity of the programme of the next number of years. We also intend to develop a programme for National Schools in 2016. Why did we develop the AsIAm Secondary School Workshop? Many students with Autism, in Secondary School, feel misunderstood, isolated or even have negative experiences such as bullying. We want to educate students to understand the condition better, to realise that Autism is an invisible condition, to understand the challenges AND the strengths of people with the condition, and also to see students with Autism as students, just like other students, first. We believe this will foster inclusion and diversity in Secondary Schools and also ensure that the next generation understand the condition throughout their lives. The AsIAm Secondary School Workshop takes place over 90 minutes and involves talking about Autism in the context of difference generally, a difference which brings challenges, opportunities and even strengths. The workshop gives a voice to the past experiences of Secondary School of those with the condition, gives students an attention-grabbing experience of Autism and also empowers students to consider how THEY can be more Autism friendly. While the workshop is a once-off event, AsIAm will work to maintain active relationships with schools wishing to implement the ideas for inclusion, their students come up with. AsIAm works to match a local member of the Autism community (person with Autism, parent, professional) to a school local to them – making the experience more engaging and real. A huge amount of time and work will be invested into personalising workshops to match the individual needs and concerns of a school and any student with Autism in the school or their family. The programme will also see us conduct research into awareness, among neurotypical students, of the challenges students with Autism face on a typical school day. Our school workshops are kindly funded by the Lions Clubs of Ireland and the Ireland Funds, however we are determined to expand and develop the programme overtime and the organisation as a whole. To that end the workshop is free of charge however we request a recommended donation of €250 per school. We will visit approximately 100 schools this year, while we provide the speaker, materials and support for the workshop. We will ask schools to sign a “Commitment Form” to cooperate fully with our volunteers, to subscribe to the values of our workshop and to work with us to implement ideas around inclusion of people with Autism, which come from the students, after the workshop. This “Commitment Form” will be sent to schools before final confirmation of a workshop. If you would like to have an AsIAm Secondary Schools Workshop in your school, please fill out the form. This form must be completed by a member of staff of the School requesting the workshop. Please note, we are expecting demand to exceed capacity but we will do everything we can to accommodate you, based on the number of speakers we have in your locality. We will add every school who does not get an initial booking to a waiting list.